Totally Not Evil Robot Army: Mojo (#12) - Servo Up! Mojo (#12) - Servo Up! Over the past few weeks, I have been contemplating enhancements and improvements to make the robot more stable and capable of sustained gait. 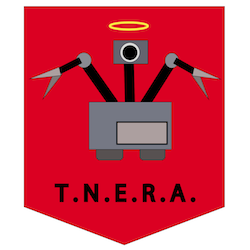 The biggest change I will make will be 'leveling up' the servos. 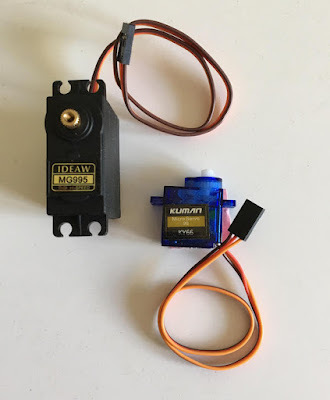 I started my Mojo project with simple plastic 9g micro servos - SG90. These servos actually work pretty well for small projects. The robot has 8 servos, and in the past three months, I have only replaced 2 of them. This included my initial burn in phase where my controller code was making the robot do extreme splits! I will be replacing the small plastic SG90 with MG995 servo. There are considerable differences in size. The larger servo will have a stall voltage at 4.8v of at 11kg-cm, and 15kg-cm at 6v. This is considerably better than the SG90 which is around 2kg-cm. The price of the servos is about 2.5 times more expensive. To replace such a core component, it will require changes to the Chassis. I will start enhancing the design for the larger, stronger servos. The placement is good, but will require a larger space. I will attempt to canter the legs in this process to try to improve the stability in the process. The current build has a high center of gravity, making it easy to topple over. a wider spread of the feet should reduce this. I will continue to drive the servos with a PCA 9685 PWM driver board. If I can drive the servos with more than 5v power, then I will get a higher performance. That will require a new power source, perhaps time to consider hobby power packs.